KFC adds a new spicy chicken sandwich to the menu with the arrival of the Zinger. The sandwich is new to us in the States but has been around sometime internationally where it's the chain's best-selling sandwich in over 120 countries. For whatever reason, KFC never saw fit to offer it in the US until now. 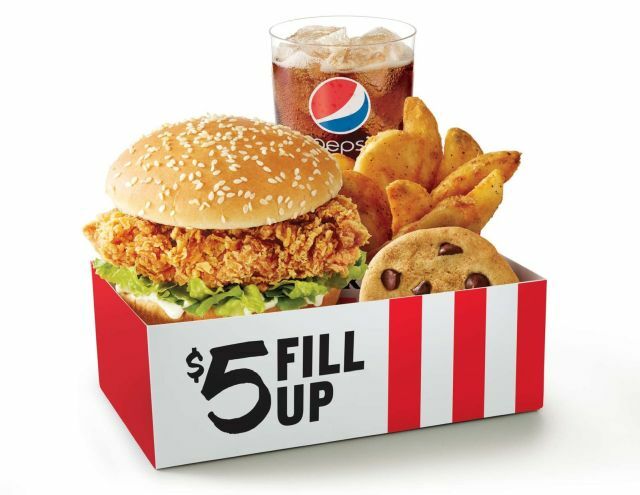 The Zinger features a chicken breast filet double hand-breaded and deep-fried daily at each KFC location. It's served with lettuce and mayo on a toasted sesame seed bun. The new sandwich can be found at participating US locations starting April 24, 2017. You can order it by itself for $3.99 (may vary) or as part of a $5 Fill Up meal, which also includes a side of potato wedges, a medium fountain drink, and a chocolate chip cookie for $5. Previously, KFC had pared down their national sandwich offerings to just the Doublicious and Chicken Littles. It looks like the Doublicious is gone with the arrival of the Zinger.